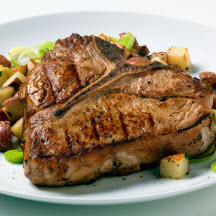 Grilled veal chops are served over a quick and easy pan-fried potato and leek hash seasoned with fresh thyme and garlic. This recipe is an excellent source of protein, niacin, vitamin B6, vitamin B12, iron, zinc and choline; and good source of fiber and selenium. Meanwhile, combine remaining 1 teaspoon thyme, 1/2 teaspoon garlic salt and pepper; press evenly onto veal chops. Place chops on grid over medium, ash-covered coals. Grill, uncovered, 15 to 17 minutes to medium (160°F | 71.1°C) doneness, turning occasionally. Nutritional Information Per Serving (1/4 of recipe): 385 calories; 11 g fat (3g saturated fat; 4 g monounsaturated fat); 113 mg cholesterol; 361 mg sodium; 37 g carbohydrate; 3.0 g fiber; 33 g protein; 15.1 mg niacin; 0.5 mg vitamin B6; 1.4 mcg vitamin B12; 4.1 mg iron, 16.0 mcg selenium; 6.4 mg zinc; 146.3 mg choline. Recipe and photograph courtesy of Cattleman's Beef Board.